The FDA said the reality-show star didn't meet product-endorsement guidelines. The now-pulled Kim Kardashian Instagram post. 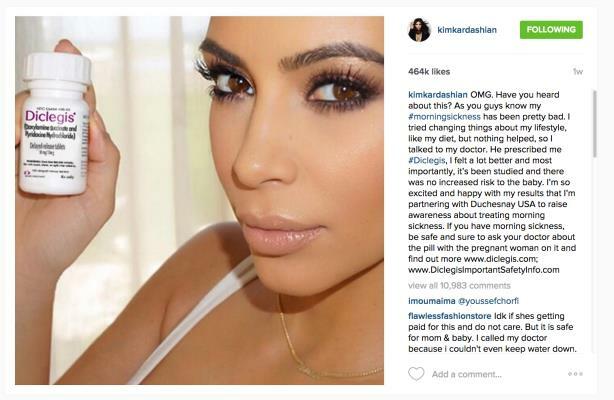 The Food and Drug Administration’s Office of Drug Promotion recently took aim at an unlikely target: an Instagram post that celebrity Kim Kardashian West made in support of morning-sickness pill Diclegis. In an August 7 warning letter addressed to drugmaker Duchesnay USA, which markets Diclegis, the federal agency said Kardashian West's promotion of the drug is "false and misleading" and fails to include any information about its potential risks. Kardashian West wrote to her 42 million followers on July 19: "OMG. Have you heard about this? As you guys know my #morningsickness has been pretty bad...so I talked to my doctor. He prescribed #Diclegis, I felt a lot better...If you have morning sickness be safe and sure to ask your doctor." She ended the post with a link to the drug's safety information website and noted she had partnered with the Canadian drugmaker. Kardashian West also tweeted a link to the Instagram post. The agency said the hyperlink alone was not enough to "mitigate the misleading omission of risk information…and suggests that it is safer than has been demonstrated." FDA officials also wrote that the post failed to include that the drug had not been studied in pregnant women with hyperemesis gravidarum. A Duchesnay spokesperson told MM&M, "We will take quick action in responding to the FDA's letter and immediately and effectively address any issues." The drug is a combination of pyridoxine and doxylamine. It was first approved under the name Bendectin in 1956 but was pulled from the market in 1983 after numerous lawsuits alleged that the drug was linked to birth defects. The FDA never found any link between the drug and fetal malformations, however, and Duchesnay submitted the drug to the agency, which approved it in 2013. As of August 11, Kardashian West's Instagram post had been taken down. This article originally appeared on Medical Marketing & Media.